A millennial practice which emerged as a profession only in the twentieth century, interpreting has recently come into its own as a subject of academic study. This book introduces students, researchers and practitioners to the fast-developing discipline of Interpreting Studies. Written by a leading researcher in the field, Introducing Interpreting Studies covers interpreting in all its varied forms, from international conference to community-based settings, in both spoken and signed modalities. The book first guides the reader through the evolution of the field, reviewing influential concepts, models and methodological approaches. It then presents the main areas of research on interpreting, and identifies present and future trends in Interpreting Studies. Featuring chapter summaries, guides to the main points covered, and suggestions for further reading, Franz Pochhacker's practical and user-friendly textbook is the definitive map of this important and growing discipline. Introducing Interpreting Studies gives a comprehensive overview of the field and offers guidance to those undertaking research of their own. 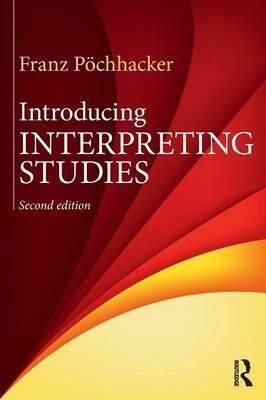 The book is complemented by The Interpreting Studies Reader (Routledge, 2002), a collection of seminal contributions to research in Interpreting Studies, and by the comprehensive Routledge Encyclopedia of Interpreting Studies (Routledge, 2015).